They said it could never be done. They told us it wasn't important. They claimed that such measures would destroy the Tooniverse as we know it! I don't know who "they" are, but today, we're proving Mr. Whoever-They-Are wrong. 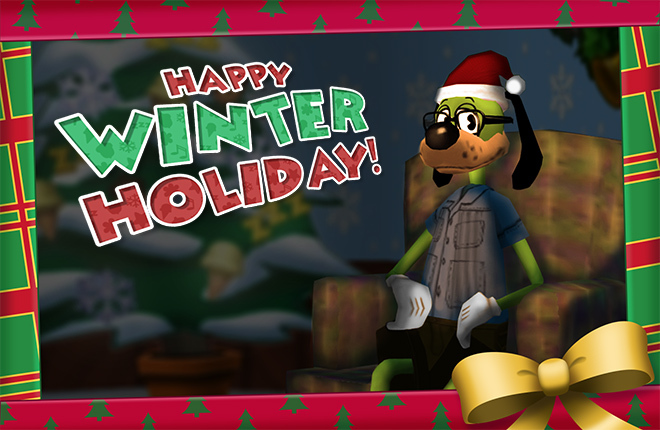 We're taking a step where no Toon has ever stepped before: W.
Not only W, but also A, S, and D! In fact, let's go for ANY key on your keyboard! Today, we abandon the direction of the Arrow Keys and tell Control that it can't control us any longer. We'll delete the Delete key and throw pies the way we want to throw them. TODAY, dear Toons, we finally have OPTIONS! You begged us, pleaded us, and even sent some rather convincing threats. 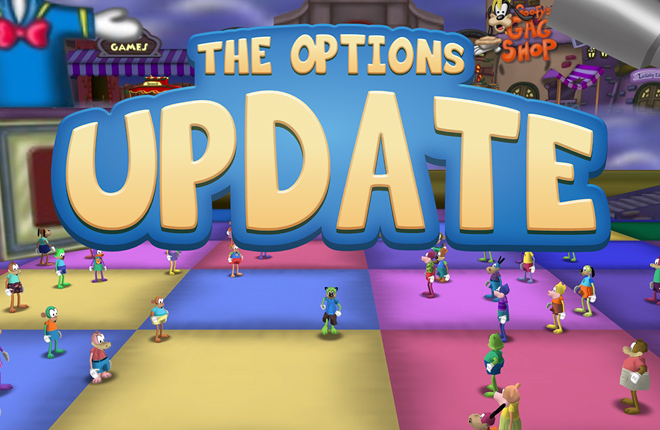 The Options Update introduces the most widely requested feature throughout Toontown's entire lifetime: Control Customization. Using a new Options Panel created specially for your customizing creativity, you can now set any action in Toontown to any key that you want. Look, I know what you're thinking: "What an innovative feature! How has no one else thought of such astounding functionality? This is bleeding-edge technology!" Buckle up, you fine observer of modernization, because we're just getting started. We're betting you're pretty excited at this point. "How can I get to this fabled Options Menu?" It's quite simple! Almost anywhere in game, this shiny new remote will sit in the lower right-hand corner of your game window. If your Shticker Book is available, it likes to hide out of sight as to not bother you while you're playing. Just hover over the Shticker Book to make it stop hiding! You can also hit SHIFT+ESC (by default) to bring up the Options Menu at anytime, or change that key combo to something else to spice up your Options Menu experience. Snazzy! You might notice how smooth running around feels after entering Toontown. You didn't slip on a stick of butter -- it's a new feature! We've overhauled Toon movement to visually appear more natural, as well as feel more natural to control with the Toon gradually speeding up and slowing down. It's subtle, but it's just a small step we're taking to modernize Toontown! Of course, if you like the classic look of Toontown, you can turn off the animation blending setting in your new-fangled Options Menu. Ever since moving into Toontown, I've ran everywhere as fast as I can. I didn't even have a choice, my feet just kept running and running unless I was going backwards! With this new update comes a key I call the "Anti-Exercise" key, but the Toon Council says I have to call it the "Walk" key. Starting today, Toons can go on a slow stroll by walking with the SHIFT key by default. Can you use this new walking ability for an amazing new gameplay experience? Well... No. But you guys still requested it for some reason, so someone out there must be pretty pumped right now! Well, they're not really. But it still sounded like a pretty catchy headline, right? What I'm trying to say is: This update is so much more than just some new controls and a campaign against exercising! 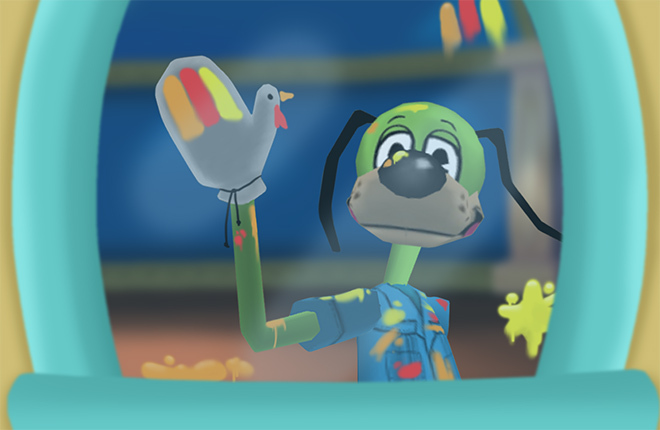 We've changed a whole lot behind the scenes to work towards making Toontown a much more modern game, and we'll be continuing to make changes in the future to keep up with the times and give Toontown the longest life it can have. You can check out the release notes below for a full list of changes, which several long-standing bugs that have finally been squashed. Let us know what you think of The Options Update, and keep your eyes peeled for the other exciting things we've been working on. • Implemented the all-new Options Menu! Check it out by clicking on the remote icon in the bottom right of your screen, or by pressing SHIFT + ESC (by default). • Fixed a crash that occurred when using a Toon Rewrite while using the Spooky Purple color. • Corrected an issue that could cause sound effects to continue playing after disabling and re-enabling sound effects. • Fixed a minor typo in Cog dialogue. • All settings that were only accessible through the settings.json file previously are now available in-game. This includes Anti-Aliasing, Animation Smoothing, Discord Integration, etc. • Adding WASD support to Toontown was our most requested feature EVER! We've now done that, and much more. • All keys that can be used in game can now be reassigned in the Options Menu. Use the control scheme that works for you! • Toons can now slow down and walk rather than run when holding SHIFT (by default). • Reworked walk controls to feel more fluid. Toons will transition to running and stopping, rather than maintaining a constant speed. • The new control system has been heavily tested by the team. However, if you run into any issues, please email [email protected] so we can get it fixed as soon as possible! • Music and Sound Effects can be individually adjusted to be quieter or louder. • Visual SFX Indicators can now be toggled from in-game. If Sound Effects are disabled, Visual Indicators will always be on. • Implemented support for borderless fullscreen display mode, which is now the default on Windows and Linux. • Legacy fullscreen support has been removed for macOS Toons, in favor of Apple's integrated system. If you’re using a Mac, you should instead use the green maximize button to toggle between Windowed and Fullscreen modes. • Added ability to turn on a Frame Rate Meter from the Options Menu. • Implemented Toony GUI transitions, which can be disabled for a more classic Toontown feel. • Fixed a longstanding bug where nametags and chat bubbles couldn't be clicked after changing the game's display mode. • Implemented animation blending for more natural Toon movement. Animation will no longer start/stop abruptly, but instead blend from one to another. This can be turned off in the Options Menu. • The Street M.A.P.S. icon is now hidden until hovering over the Shticker Book to avoid screen clutter. • Fixed a bug in the Toontorial where the left/right keys could be pressed to view other pages of the Shticker Book while talking to HQ Harry. • Simplified the Options & Codes page to combine the two tabs into one. FINALY!! now i played ttr on a mac witch has an annoying tab switch/window switch thingy that cannot be disabled and now its no more thanks ttr! That is awesome! Thank you very much TTR Team! So pumped for this update! I have been waiting so long for the chance to change the arrows to W A S D keys. So excited! Thanks so much for keeping this free game the fun experience it has been for the past years. God I love you guys. You make me so darn happy to live on this timeline. The timeline where there are people who care about other people. People who care so much, that they do all these wonderful updates and glorious things to this game from our childhood that we hold so dear to our hearts. Everything you guys have done so far has made me, and thousands and thousands of other people extremely happy. Eventually when I start working less, I'll definitely be volunteering my time to your project because of how much I support you guys. Thank you once again. While I do appreciate this update, I wish that it was the field offices update! 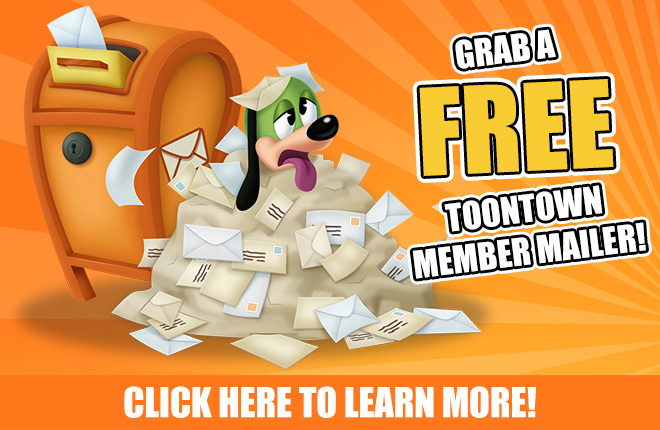 Or even a winter toonfest, etc.Or possibly after the update, refilling everyone's gag bag? I got kicked as I was finishing the 5th floor of a cog building.. Or new phrases in the catalog? As of right now I would like to suggest an energy meter, that you charge up over time so you can run faster? Or just adding tasks to access HQ teleports faster? Or even tasks on the go? Thank you TTR! Dear flippy... the impossible is possible! W O W . A M A Z I N G ! Thank you for another fantastic update! Sounds awesome! I've long awaited sound meters! I like it, but I hope I can still type with letter keys to bring Speedchat+ up. Ooh, exciting! I can't wait to see all the new features! Oh, and thank you SOOO much for adding WASD movement... You guys are doing great! Can't wait... does anyone know when the update ends? Woohoo, I was waiting for that rewritting fix! This is wonderful! I'm excited to test this out and see the new animations. Walking sounds like a great idea, I really like being able to control my speed in a game. Fighting the VP will be a lot easier for me now, too. Goodbye, delete key! Glad to see the game really beginning to move forward. Will be honored to use the new updates in my future gaming and for all e-toon-ity, (tried my hand at a pun on eternity, tell me what you think). This is awesome! Even though not much has changed story-wise, controls are always nice. Love the video and the post. You guys are awesome!!! I love this It really sounds like you all are modernizing Toontown to keep up with newer games. Thank you all so much for what you do. This sounds amazing! I can’t wait to go on ttr! Okay, the ability to walk and change button command is really interesting to me. And so is the other options added from settings.json! But the fact that you fixed the nametag issue makes me so happy. This sounds like really juicy stuff! I appreciate you guys' hard work! sweet! No longer do I have to awkwardly have my control key stuck down because I use Dragon NaturallySpeaking to supplement my control set up and compensate for a spinal cord injury. NOW I can have some other random key stuck down in its place! Wait, how does this affect speed chat +? I assume we have to click the bubble if we want to type a instead of turning to the left if we have WASD for movement? I have so many questions, but I'm nonetheless incredibly pumped about this update! Thanks Joey, Alex Wave, Azure Swallowtail, <any other staff member names I know of because you don't seem to have an official roster>, etc.! It's been awhile... Hi again, haven't played this game in forever but this is sick. -Simplified the Options & Codes page to combine the two tabs into one. However, now there are 2 separate option pages and the speedchat color option is still on the combined page. This is amazing, beautiful work as always! oh ok thats pretty gooood. These updates are everything I've always needed! Good job TTR team!! Alright! Can't wait to play with WASD!!! Does anyone know when it will be back on? OMG I NEED IT! I play on my notebook and play in the arrow kaeys are very difficult, this new way its be better to me! Thanks very much! Wow, you guys are beyond awesome!! Amazing! This opens up so many new opportunities to how we play! Thanks guys! The options page is really simple to me and easy to understand! thanks haha ! It’s great to see toontastic updates like these, can’t wait to see what the Toontown Rewritten team has in store for us in the future. Toons of the world unite! Thank you guys for all your hard work!!! Love this update. We stan skinny legend Joey and the TTR Team. Thanks for the awesome updates! And I've always thought that the sound should be able to be individually adjusted, so I'm so happy we can do that now! Great update! I especially like how we can change the settings to experience a classic Toontown look. I went ahead and disabled accessories haha. Thanks for putting that feature in! Yes, goofy goober, you can in fact, reassign keyboard combo keys on your Mac to take that pesky screen swap feature out of service. I did it on my Mac and have told numerous players how do to it while we were playing the game. It's too late to help you on Toontown but you might find it of use in other applications on your Mac. This is the update we've all been waiting for. Wow! I'm excited for what comes next at this rate! I still use the old way... but very awesome job!!! I love how smooth everything is and the easy access is great!! Wow!!! This is very useful!!!! Thanks for the update! I haven't had a chance to try it out yet but I'm delighted that we can now turn the Toontown music down rather than just off - I love the nostalgia of hearing the music. I cant wait to log on! Thanks you Toontown Rewritten staff - you are amazing and I cant wait to see what else is new! Oh my goodness! I have been waiting for this day to arrive since I started playing Toontown! Props to the development team! Amazing! Mac users can throw pies! THANK YOU for this update!!! Especially the walking animation! This is Toontastic! My computer goes to the home screen every time I press control+left and I'm glad to see this amazing update. This is great! Something we've been waiting for for a long time! Well I'll be a monkey's uncle, these new features are toontastic! I like these updates. The only downside of the default borderless option is that you can't move the window around. Need to select windowed to be able to move the window to a different location on the screen. Finally! I was waiting for WASD support for forever! You've got no idea how excited I am to not run. Since update my mouse/cursor does allow me to click where my mouse is. I literally have to put my mouse above what I want by maybe a half an inch. Very difficult in battle. Why is this happening? Is this a bug and can it be fixed? Thank you! Finally i can use WASD keys! How revolutionary! This change will be recorded in the finest history books. Wow... you guys sure have been working hard on this, haven't you? THANK YOU SO MUCH for adding this feature! And thank you for fixing that bug where you couldn't click on chat bubbles and nametags after changing the game's display option. I remember a couple times when that happened. It was so annoying to me. 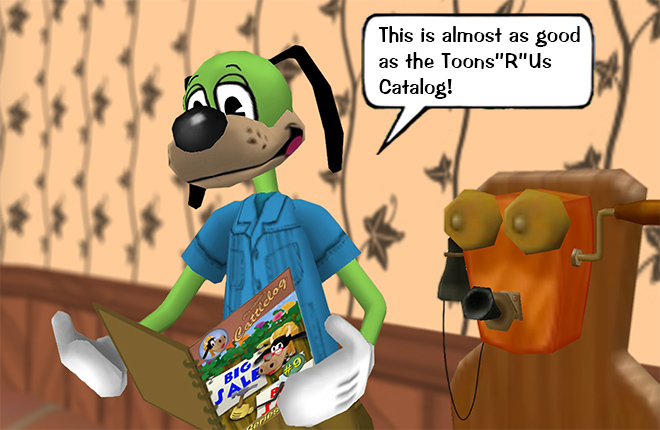 I can't wait to play Toontown! God you guys never fail to amaze me!! You guys are just absolutely wonderful and im proud of how far you guys came. Keep it up and shoot for the stars :)! Can’t wait for more updates!! On behalf of Mac users everywhere, I thank you! Lovely content you guys!! I've been waiting for this for such a long time! Back in tto I hoped they would add this but they never did :( But you guys STEPPED UP AND DID!!! Proud of this community and the toontown rewritten staff! Thank you for all the great content!!! Can't wait to see more in the future :)! This is what I call a modernizing update. Let's keep bringing TTR into the 21st century! This update is amazing! It didn't work on my computer at first, but thanks to the quick help of the support team, it's up and running! All of the UI changes look great, and all the upgraded animations help the game to look so much better, and I just lose myself even more in game! I also absolutely love the render distance options, there's no longer an awkward pause in waiting for buildings to load! It's absolutely toontastic! Great work! Whoa! Didn't expect this update! This is really cool! Definitely gonna try this out. This is a step into hopefully improvement! Omg the new movement is amazingly smooth! I was very surprised by this when I logged in last Thursday. I’ve started exploring the new features, including the animation blending that I wasn’t sure about at first, but after playing with it on for a few hours today, I love it. It’s a great update. I wouldn’t be that surprised if this update brings more kids to the game. Great work! Thanks For Adding This TTR! Awesome! I suggested this early on in this game - I'm glad to see it happening! Wow crazy how this is around, so much nostalgia! Love it, especially love 3D mode!